Dharmshala: Governor Acharya Devvrat today visited Agriculture University Palampur in district Kangra and during his continuous three hour visit on foot to different Centers of the University; he took stocks of various activities being run by the University and also gave direction to the concerned scientists to improve the quality. He interacted with the scientists and got important inputs about their research activities. 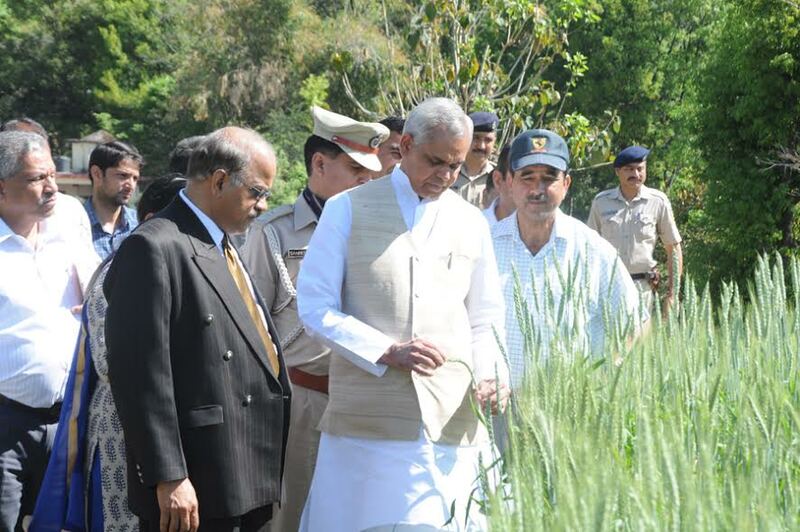 The Governor visited Zero Budget Organic Farm working under department of organic agriculture. He expressed satisfaction, the university was doing natural farming under his mission and demonstration farms of natural farming were fully prepared. He was happy to see that the yield of natural farming was much better than organic farming, which showed that natural farming was safe and ensure better results. He directed Deputy Commissioner Shri. C.P.Verma to convene a meeting of University scientists with the officers of university and horticulture at district level so that they could work in close coordination for the betterment of the farmers. He also visited seed production farm of the university and asked the concerned authorities to preserve traditional seeds of the area. He also visited Teaching Veterinary Clinical Complex working under Veterinary Collage at Holta. He interacted with the veterinary doctors. Head of TVCC Dr. Pankaj Sud briefed about the clinical examination of animals and treatment. He also explained about the new innovation for transfer of technology and said that more than 80 percent animals cured after treatment in the centre. The Governor said that the process of artificial insemination adopted was not up to the mark and the experts should train them to minimize the spreading of infection from one animal to another. He added that it was important for saving the Indian breed cow. He also visited Sperm Station of HP Livestock Development Board. Dr. Sandeep Jasyal Additional Director briefed about the activities of the centre. The Governor directed them to rear Indian Bull as they were much better than the foreign breed so far as production was concerned. Dr. Ashok Saryal Vice Chancellor, Agriculture University, Palampur, Head of the departments, scientists, Superintendent of Police Shri Sanjeev Gandhi and other senior officers were also present on the occasion.